“We are very excited to announce that we are opening classes for students who don’t have a Japanese background next fall! 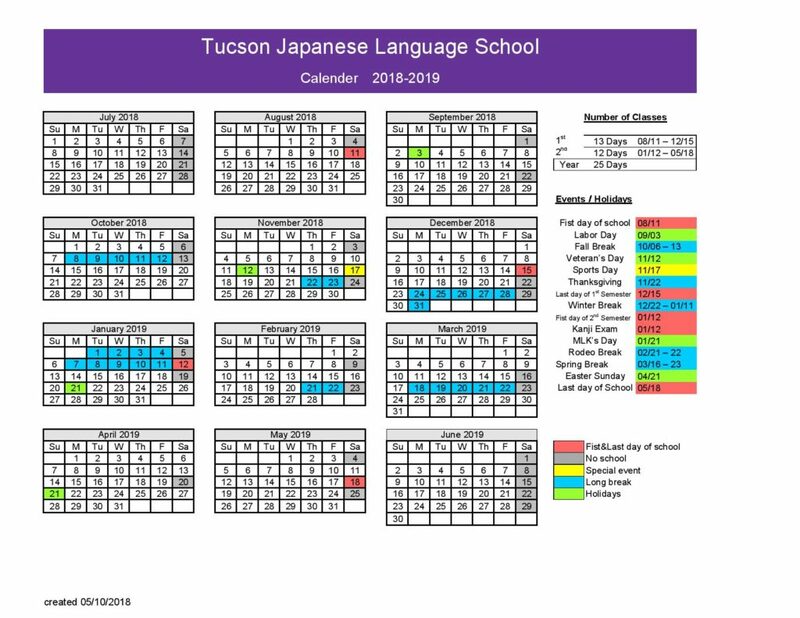 Last three years, Tucson Japanese Language School has been dedicated to providing Japanese children opportunities to learn Japanese language and culture in a school setting with their peers and also helping families to immerse their children cross-cultural experiences to deepen understanding in Japanese culture and tradition. This coming academic year, we would like to invite children in all over Tucson who is interested in Japanese language and culture to experience our one of a kind program. Please see the attachments below for the details and see if your child qualifies. ” Come stroll the gardens after dusk while listening to recordings of Japanese folk melodies. 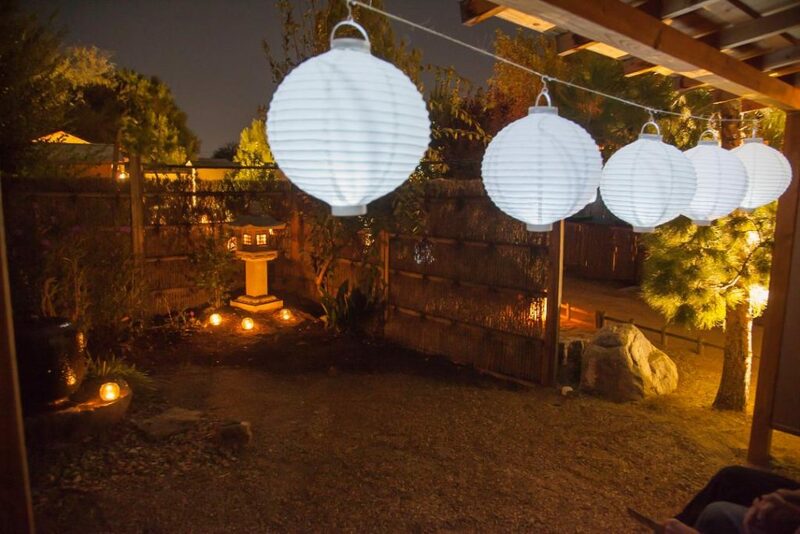 The gardens will be softly illuminated by lanterns and candlelight. Japanese food will be available for purchase from the Takoyaki (Balls) Food Truck. 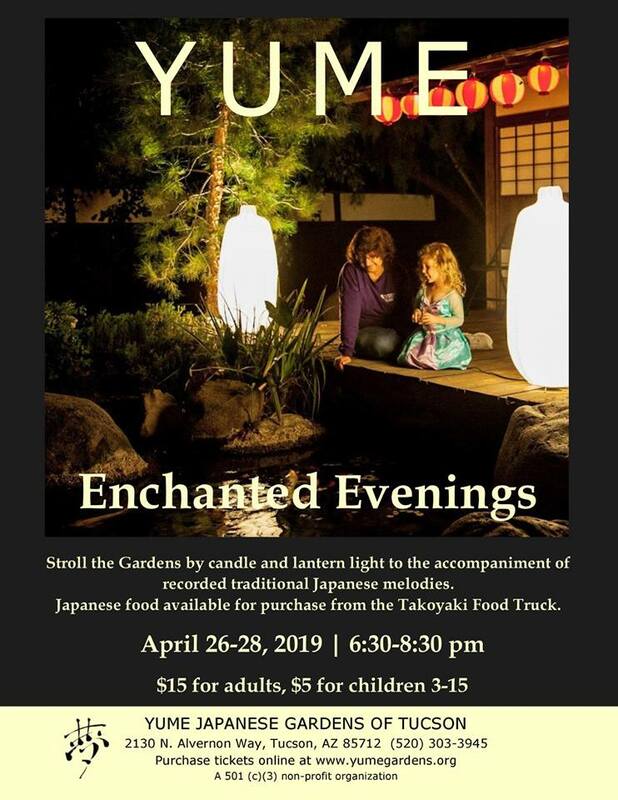 Enchanted Evenings runs Friday, April 26 through Sunday, April 28, from 6:30 to 8:30 pm each night. 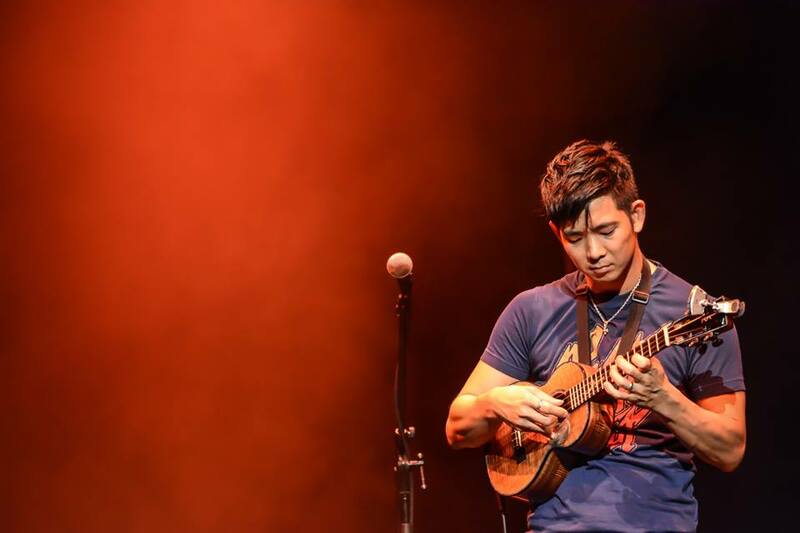 Jake Shimabukuro, ukulele master from Honolulu Hawaii is returning to play his ukulele at the Rialto Theatre. He is Gosei, 5th generation Japanese American. 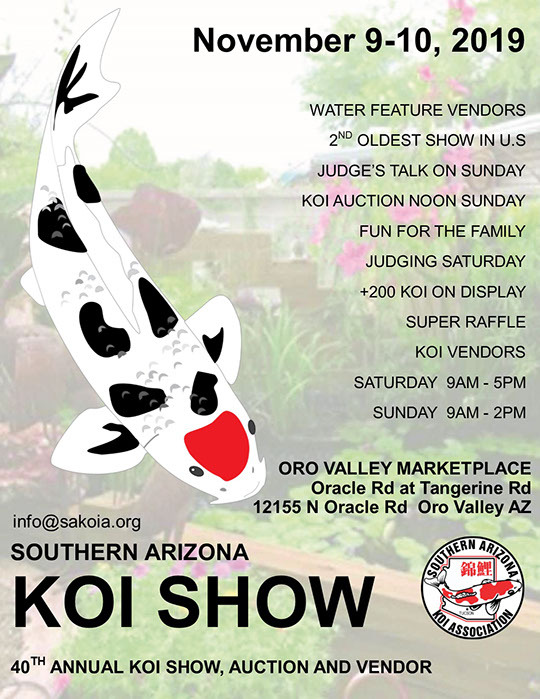 “We are having a party to promote friendship and interaction within our Tucson community.It’s also an excellent opportunity for anyone who is interested in Japanese culture. Let’s enjoy socializing with the people working in different disciplines. Everyone is welcome, especially newcomers to Tucson. （Tip included, drink not included）Please give the fee on site (accept only cash). ” Shidara was founded in 1989 by artistic director, Chabo. With deep roots in their remote Japanese village, Shidara performance carries a purity and devotion to the forest, and a festival harmony between the human and spirit worlds. Members practice and train eleven hours a day. They exceed mental and physical limitations as a way of life, creating an explosive dynamism onstage. Shidara hopes to bring people together, joining hands in reciprocal support while walking the essential path of mutual encouragement. Shidara’s exciting musical performances have created a huge stir in the North American Taiko communities and received standing ovations at the U.S. debuts, ensuing the popular demand which inspired their now extremely successful North American Tour! 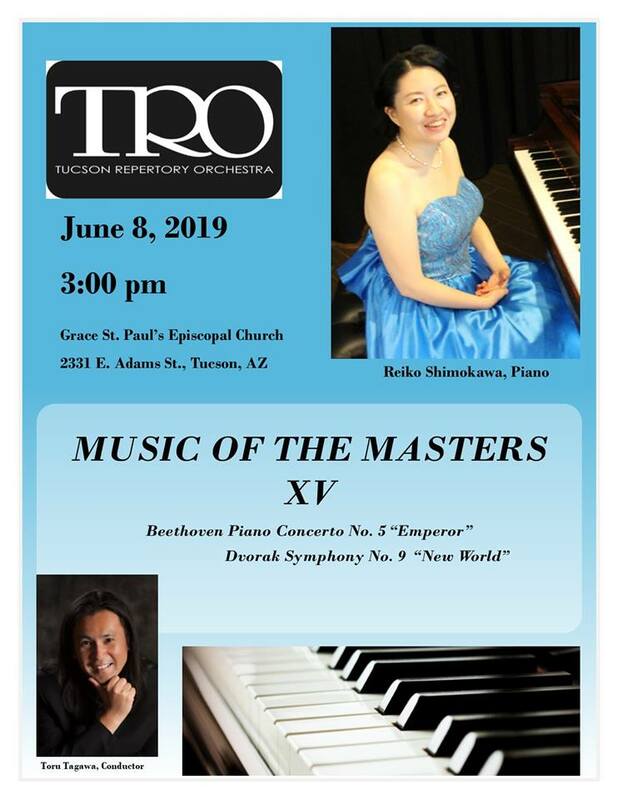 Also a TRO family concert at 1:30 p.m at same church.